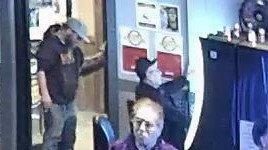 On Tuesday, December 19th around 4:30 p.m. these subjects were involved in a theft of a custom rug from Bombers Sports Bar on Elk Street. As they walked out one of them pulled the rug into the lobby with his foot and took it. The rug is a gray with a duck holding a beer and pool cue with Bomber Sports Lounge printed on it. Anyone with information should contact Officer Johnson at 307-371-1491.